Apple’s Tim Cook announced stellar earnings yesterday, exceeding analyst estimates but not surprising us at Forrester. We have predicted for a while that Apple was poised to become the world’s first trillion-dollar company (at the moment of this writing, the company’s market cap stands at $982 billion). Apple’s products are outstanding, and its revenue outlook will be bright for years to come. This is the main point: Equal numbers of US consumers are customers of each company. 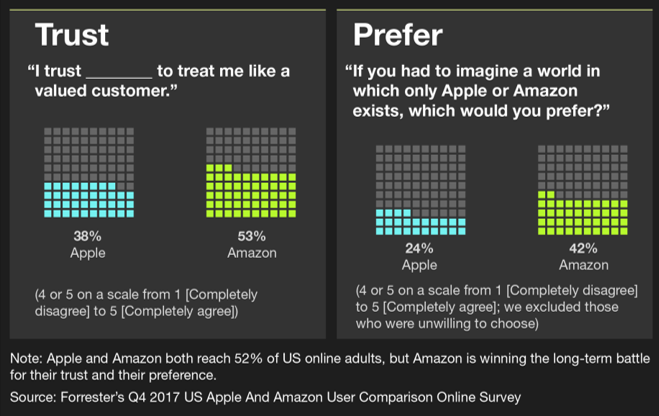 But Amazon is able to earn more trust than Apple (53% vs. 38%), and when forced to choose between the two companies, a plurality chooses Amazon — 42% — which is higher than the number of people who could not make a choice. The average US Amazon Prime member buys from Amazon every six days. Add the frequency with which people turn to Alexa for answers and assistance, and you have a recipe for Amazon becoming more top of mind than even the phrase “Google it” achieved. Once Amazon adds the recently promised intelligence to Alexa, making conversation more useful and natural, the frequency of use will double — and the urge to put devices in cars, workplaces, and hotel rooms will become irresistible. This isn’t love so much as persistent usefulness. In our report, we explain that Apple can fight back and make a play for higher-frequency use and an even more useful brand position. Specifically, we recommended that Apple double down on its services business, which includes Apple Pay. We were pleased to see in Apple’s earnings that exactly that is already happening. That’s the right start. But we believe there should be more. Apple needs to make a play for a deeper relationship in the home, so much so that we recommend the company buy Segway and co-opt the Loomo personal robot that company has recently built. Add Siri to that thing, and you’ll have the makings of the first personal robot assistant product that could earn billions. And Apple should take the plunge and become a marketing services platform like Amazon and Google already are. It means embracing advertising, which Apple doesn’t want to do, and it means figuring out how to use data for marketing services in a way its customers will approve of, given the company’s strong public stance on issues of privacy. All of this is doable; it’s just a question of whether Apple wants it badly enough. Will the company that can sell a $1,000 phone to millions of people really believe that it is losing the long-term battle for hearts and minds? We hope so. Because when Amazon becomes the second trillion-dollar company before 2020, the resulting competition between these two titans will yield massive innovation and customer value for the rest of us. 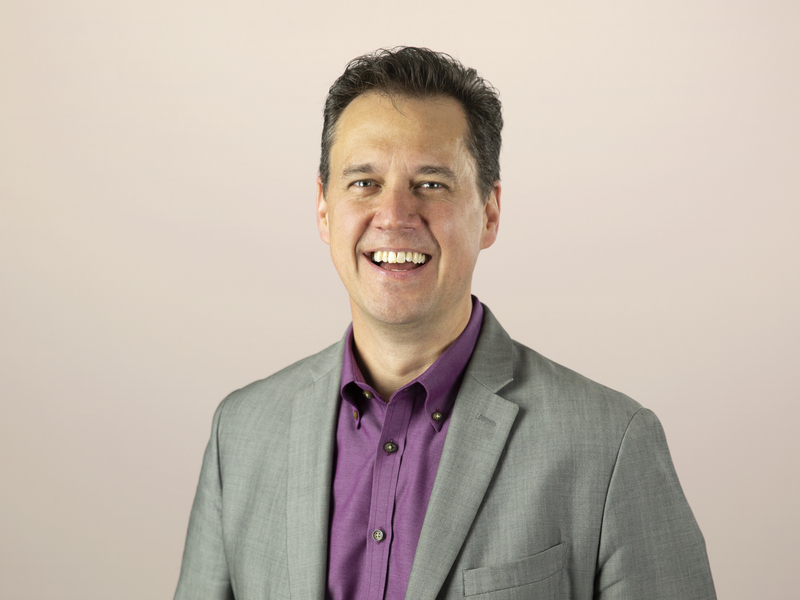 James McQuivey, Ph.D. is a VP and principal analyst at Forrester who has covered Apple for 20 years. He correctly predicted the success of Apple Watch, and he correctly predicted that Apple would not do to video what it did to music. In other words, he calls it like he sees it when it comes to Apple and everyone else. He is the author of Digital Disruption: Unleashing the Next Wave of Innovation.